• 100% Satisfaction Guarantee. Love it or your money back. 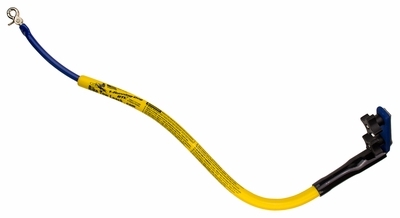 The Bike Tow Leash is hand-made in the USA and signed by the creator himself! The 1-Running-Dog Bike Tow Leash® let's you safely take your dog on bike rides with a design that takes into account both the laws of physics and dog behavior. Your dog's ability to pull to the side is greatly reduced and the tipping forces are virtually eliminated with the Bike Tow Leash. This goes for even the most powerful pullers. Rest assured that you will maintain control even when coming across the occasional cat or squirrel. 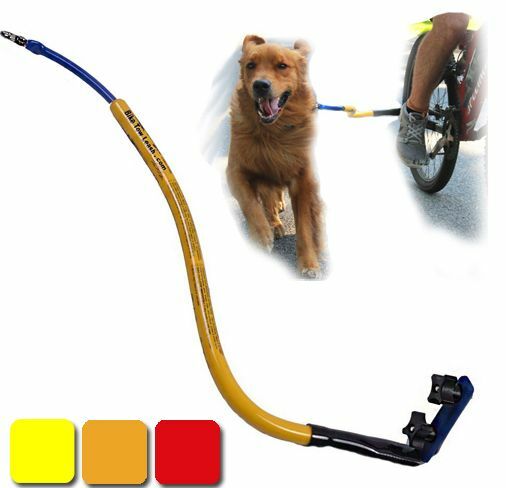 As you can see in the Bike Tow Leash videos on this page, this bicycle leash has outstanding shock absorption and most owners comment that they barely even feel their dog pulling. Check me out biking a 180 lb Great Dane in the video below. The Bike Tow Leash can truly handle even the most powerful of dogs while allowing you to maintain control. 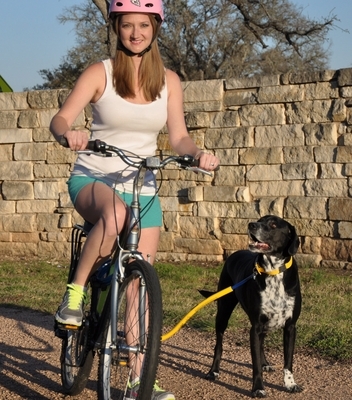 American Pet Association Product Review of the Bike Tow Leash! 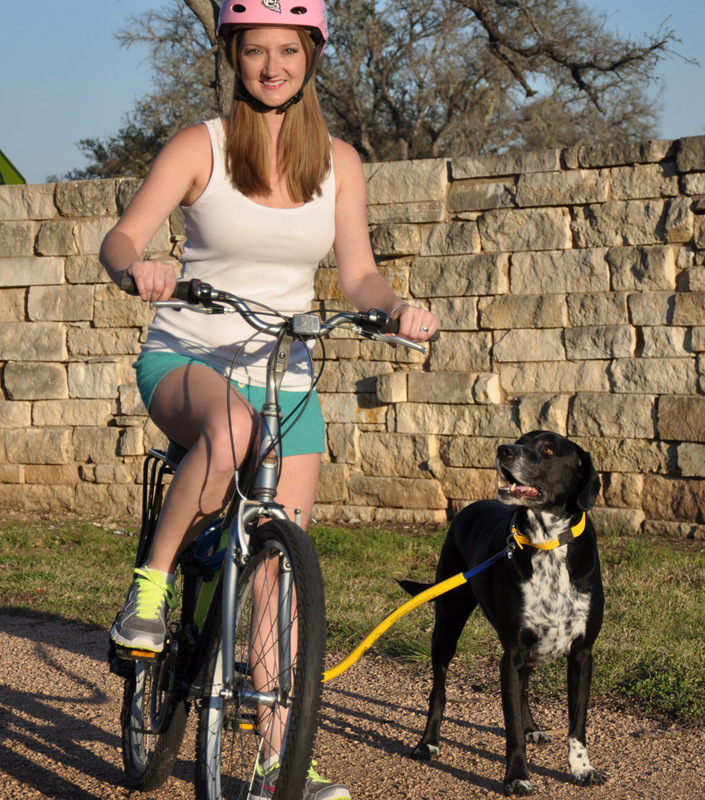 APA Advice - Riding with your dog, when handled responsibly, can be a great activity for you and your dog. 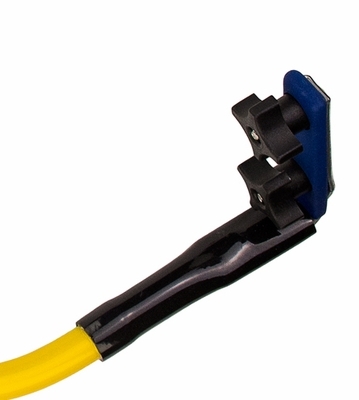 This product is the only such device we have considered approving and it exceeded our expectations. We will say it again, most of the time we all breeze over or ignore instructions. With this product, take time to read every word and adhere to the warnings. 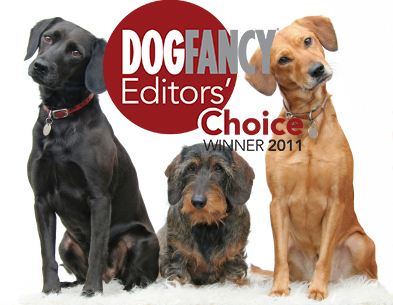 Your dog deserves it! The 1-Running-Dog Bike Tow Leash® dog bicycle attachment was invented by entrepreneur, Mike Leon who is well versed in both dog behavior and engineering. Leon - a former airline equipment engineer - put 6 years into developing the perfect dog bike leash. The flexible yet resilient materials on the Bike Tow Leash are unlike any other dog bike leash on the market. 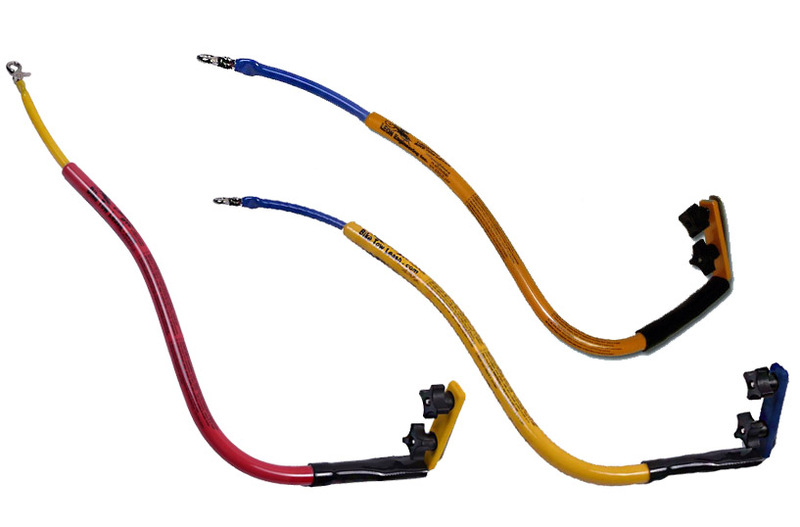 The patented flexible mast of the Bike Tow Leash encourages the dog to stay away from the pedals, while allowing them to pull you along or fall back when navigating through tight spaces. It really takes seeing the Bike Tow Leash in action to understand how it works. Check out the videos tab above. 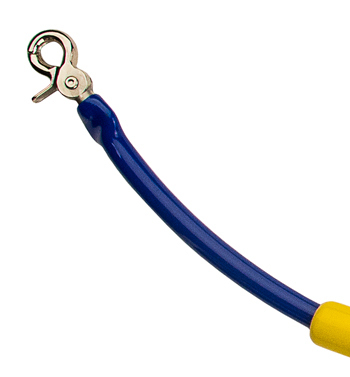 Mike has become a good friend of ours since we began selling the Bike Tow Leash. He and his family are just all around good people. Mike has always had a soft spot in his heart for dogs and he clearly engineered this dog bike leash system with their utmost safety in mind as well as that of the rider. Read more of Mike's story below. My name is Mike Leon, mechanical engineer, avid bike rider, service dog trainer and inventor of the 1-Running-Dog Bike Tow Leash. After the 9-11 terrorist attacks, my family and I started raising service dog puppies for individuals with disabilities as a way of giving back to our community and country. In honor of those lost, we named our first puppy Tribute. Raising service dog puppies is a wonderful volunteer opportunity, which ultimately provides companion animals to individuals who suffer from seizures, or who have mobility, vision or hearing impairments. As trainers, we raise, train and socialize puppies until they are ready for graduate school. For socialization, we take the puppies, in a service cape, to stores, restaurants, schools, theme parks, etc., to expose them to a variety of situations. This ensures that there will be no unpleasant surprises once they have been assigned to a client who is depending on them to remain calm and alert at all times. At about 6 months of age, Tribute, now a tall long-legged black Labrador, had more energy than I did when we went out walking or running. With all her puppy energy, we needed to make sure Tribute exercised strenuously before we went out to eat. Since bad behavior is often a result of a lack of exercise and dogs in training are supposed to lie down and sleep under the table, not stand and upset dinner. As the saying goes, necessity is the mother of invention. As a result of Tribute's need for speed, and my more limited energy levels, I got the idea to combine the fun of biking (for me) with the fun of running (for Tribute). I set out to make a device which would make biking with a dog pleasurable and fun while eliminating these safety concerns for both rider and dog. Since my career as Airline Equipment product development engineer ended after 9-11, and the Bike Tow Leash worked so well, I used my time to refine, test and patent the Bike Tow Leash. See The Bike Tow Leash In Action! Testing Results - As advertised, a strong and useful product. 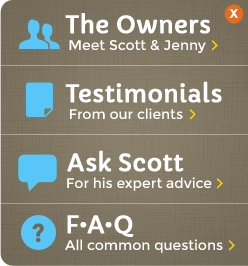 "Hi Scott, The Running-Dog Bike Tow Leash is fantastic! My 1-yr old Goldendoodle loves to run... no, she NEEDS to run! Unfortunately, her needs exceed my 59-yr old body and artificial hip, so I've been trying to find a good, safe means of running her with my bike. I've tried a few; some devices make me feel like the guy in National Lampoon's Family Vacation--dragging my dog behind me where I cannot see or feel her just doesn't cut it. Others attach to the bike or the dog in ways that don't feel very stable. 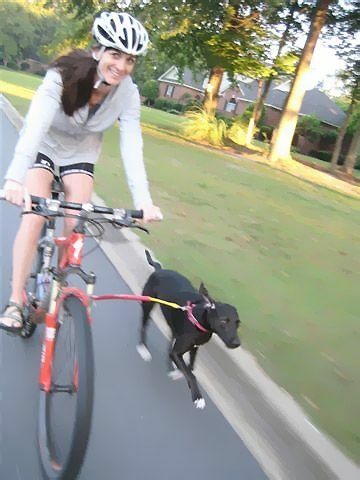 Before finding the Running-Dog Bike Tow Leash, the best method was riding one-handed and "spooling" her leash in and out with one hand. It worked, but was too risky to continue doing, especially in wet or icy conditions! With the Running-Dog Bike Tow Leash, I can ride with both hands on the handlebars and my sweet dog can run joyfully beside me! I can see her and what pace she wants to go, and believe me, she LOVES to run! On the very first time we used the RDB Tow Leash, she figured out exactly where to be and how to follow my directions for turns, stops, etc., and we were literally "off and running" by the second city block! Now, she gets excited and races to the garage as soon as I get out her Ruff Wear Harness! Between my dog's enjoyment, the outstanding exercise it provides us both, and the safety factor with it, the Running-Dog Bike Tow Leash worth its weight in gold.